Place the flour, sugar, and salt in the bowl of a food processor fitted with a steel blade. Pulse a few times to combine. Add the butter and toss quickly (and carefully!) with your fingers to coat each cube of butter with the flour. Pulse 12 to 15 times, or until the butter is the size of peas. With the motor running, add the ice water all at once through the feed tube. Keep hitting the pulse button to combine, but stop the machine just before the dough comes together. Turn the dough out onto a well-floured board, roll it into a ball, and form a flat disk. Wrap the disk in plastic and refrigerate for at least 30 minutes. Cut the peaches into bite-size pieces, and place them in a bowl with the blueberries. Toss them with 1 tablespoon of the flour, 1 tablespoon of the sugar, the orange zest, and the orange juice. 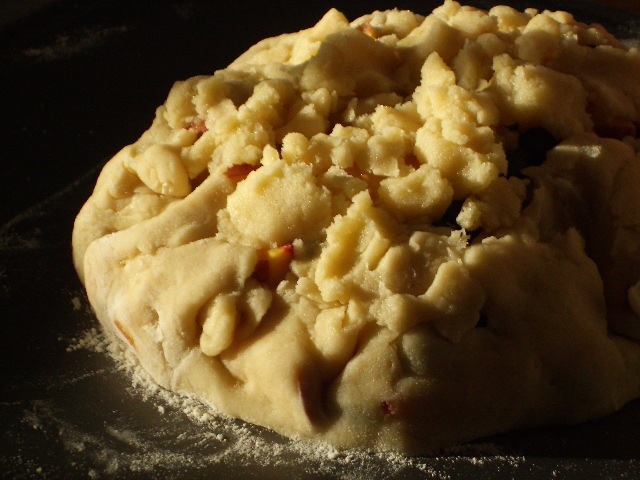 Place the mixed fruit on the dough circle, leaving a 1 1/2-inch border. 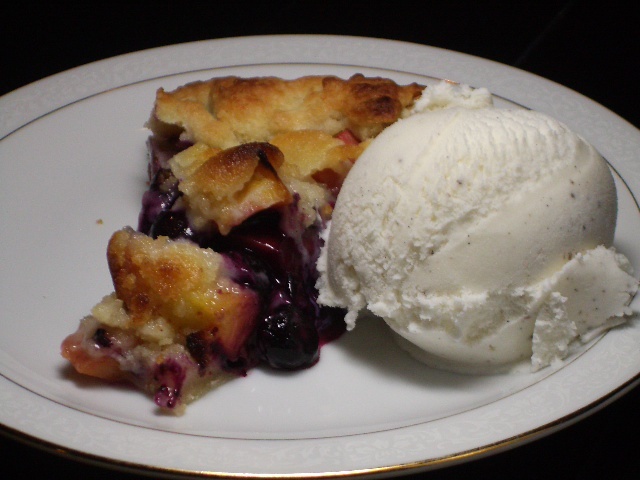 Bake the crostata for 20 to 25 minutes, until the crust is golden and the fruit is tender. Let the crostata cool a bit. Serve warm or at room temperature with vanilla bean ice cream. ENJOY! This recipe is based on one from Barefoot Contessa’s – see her’s here.